Judge Ward served as a United States District Judge for the Eastern District of Texas for 12 years from September 24, 1999 until his retirement on October 1, 2011. During his 12-year tenure, Judge Ward presided over cases in the Marshall, Tyler, and Texarkana divisions and had one of the heaviest intellectual property dockets in the country. Judge Ward conducted over 150 jury trials, presided over hundreds of patent cases, including Hatch-Waxman cases, and held in excess of 150 claim construction hearings. Judge Ward also presided over numerous complex commercial cases and nation-wide class action lawsuits. A list of some of Judge Ward’s notable opinions appears below. During his tenure, Judge Ward was appointed by Chief Justice Rehnquist of the Supreme Court to serve as a member of the Judicial Conference Committee on Court Administration and Court Management from October 2003 to October 2006 and was then reappointed by Chief Justice Roberts to serve a second term from October 2006 to October 2009. Judge Ward served as a member of the National Patent Jury Instruction Project at the request of Chief Judge Paul R. Michel of the United States Court of Appeals for the Federal Circuit. This project was completed in June 2009, and the results may be found at http://www.nationaljuryinstructions.org/. The American Inns of Court, in cooperation with the members of the local bar, chartered the Honorable T. John Ward American Inn of Court for East Texas in 2006. In 2009, the Texas Chapters of American Board of Trial Advocates named Judge Ward Trial Judge of the Year. 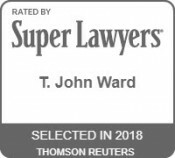 Judge Ward was selected as one of the Top 25 Most Influential People in IP by a publication of American Lawyer magazine in 2010 and was also presented the award for Outstanding Achievement in Intellectual Property for 2012 by Managing Intellectual Property magazine. In 2004, Baylor University named Judge Ward Baylor Lawyer of the Year. Judge Ward served on the Board of Governors of the Fifth Circuit Bar Association from 1987 to 1991 and from 1996 to 1999. Judge Ward is also a Life Fellow of the Texas Bar Foundation, a long-time Fellow of the American College of Trial Lawyers (1986-1999 and Oct. 2011-present), where he also served as a Judicial Fellow during his years on the bench (1999-Oct. 2011), and an Advocate of the American Board of Trial Advocates (1990-present). 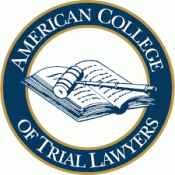 In 2013, Judge Ward was inducted into the International Academy of Trial Layers. Prior to his service as a District Judge, Judge Ward was a practicing trial attorney for 31 years, during which time he tried in excess of 250 cases. Judge Ward now is of counsel for Ward, Smith & Hill, PLLC in Longview, Texas. His litigation practice focuses on patent and other complex commercial cases as well as mediation and arbitration. Judge Ward also conducts mock trials and markman hearings for clients in patent cases. 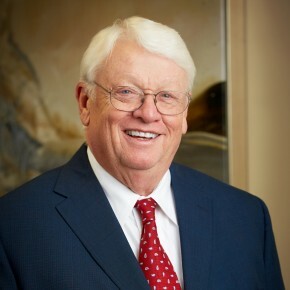 Judge Ward is a graduate of Texas Tech University, where he received a Bachelor of Arts degree in Chemistry in 1964. He then went on to obtain his law degree from Baylor University in 1967. Judge Ward is licensed to practice law in Texas and is admitted to practice before the U.S. Supreme Court, the U.S. Court of Appeals for the 5th Circuit, the U.S. Court of Appeals for the Federal Circuit, as well as the Eastern, Northern, Southern, and Western Districts of Texas. Judge Ward has completed the Mediation Workshop at Harvard Law School. In April 2013, he served on the faculty of the Patent Litigation Seminar presented by the Federal Judicial Center for U.S. District Judges.